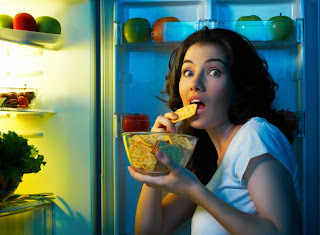 Bariatric Direct Blog: Should You Eat Before Bed? Most of us crave a bedtime snack, whether we retire to bed early in anticipation of a hard day’s work, or are night owls staying up to watch our favorite late-night television show. While we’re generally taught to believe that eating before going to sleep can be unhealthy, there are a number of foods that burn fat while we sleep and may even assist in the quality of sleep! Many vegetables contain few or no calories and provide a high-fiber solution for a late-night snack. They are filling, and you can generally eat as much as you want without adding fat. Be sure to select green vegetables that contain few calories, fats, and carbs. Celery has minimal calories while corn, for example, is higher in carbohydrates. Eating cottage cheese before bed can possibly be good for you. Look for sugar-free cottage cheese brands that do not contain added ingredients. Cottage cheese is slow to digest and known to stimulate glucagon for breaking down stored carbohydrates and fat within the body and burning them for energy. If you enjoy white meat such as chicken or poultry, this high-protein snack is lean, delicious, and shows a low insulin release. White meat is also known to stimulate glucagon and use fat and carbs to burn energy within the body. Partaking in low-carbohydrate protein shakes can be a satisfying dessert snack in the flavors you love, and you can find some supplements or other low-carb ingredients to put into the mix. If your diet permits, almonds, almond butter, popcorn, fat-free yogurt, and other healthy alternatives may work for you before bed as well. A little planning and a look at the food labels can go a long way toward a healthy bedtime snack, and leave you satisfied in the process. While most people generally know what snacks to avoid—those high in fat, carbs, and sugars—you may not realize how many ingredients are packed into foods that actually lead to poor health. Unfortunately, many unhealthy ingredients are hidden in what we often consider healthy foods. For example, high-fructose corn syrup is found in many yogurts, cereals, health bars, salad dressings, and sauces, and it is not a healthy option. Monosodium Glutamate, or MSG, is found in many soups and packaged foods to give it flavor and yet many people are allergic to it. Check the labels of everything you eat, and especially be selective in what you choose. If you are wondering whether you should eat before bed, consider the foods that may provide a health benefit. Check the labels, reduce the carbs and sugar, and indulge in a guilt-free, beneficial sleep-time snack.